About 20 years ago, researchers in Japan burned bamboo at high temperatures to create bamboo charcoal, which exhibited properties vastly different from the bamboo plant, including a high density and porous structure. 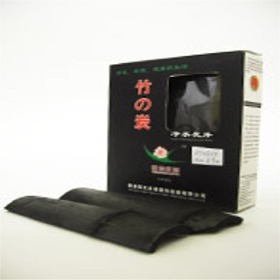 Called Takesumi or Chikutan in Japanese, bamboo charcoal also has high mineral content such as calcium, potassium, sodium and iron. Over the years, many uses have been created for household to bedding and personal care. Bamboo Charcoal slices are able to absorb harmful chemicals like chlorine, pesticides in the water and at the same time diffuse more natural minerals like calcium sodium, magnesium and gallium that help to purify the water. Adding a bamboo charcoal into water, rice, soup does help to enhance the food to taste better and healthier. One box contains 5-6 pieces. Each piece weighs around 15-20 grams. The Bamboo Charcoal can last for 3 months. It can be used for cooking rice, soup and boiling water. Bamboo Charcoal can also help to balance the pH value of water and extend water life span in fish tanks or act as fertilizer for plants. Read further on clean and maintain your Bamboo Charcoal here. Im not sure I really believed much of the hype around this stuff. After all, activated charcoal to filter water is quite a common thing. Still I thought I would order some anyway. The charcoal itself is very dense and hard, and no pieces or dust come off into the water. I keep one piece in my kettle and another in my filtering water pitcher. A regularly changed water filter will do much more to improve your water quality, but the charcoal seems to add just a touch of other things that make the water really crisp and nice to taste. Im actually a bit impressed and will continue to use this stuff, but it for sure wont turn terrible water into perfection.